January was generally cool and dry due to the calm and stable conditions that persisted for much of the month. For most locations, there were only two active and warm periods during January. The first stormy period occurred around January 6th to 10th, with the second happening near the end of the month. Strong mixing and influxes of ocean air caused warming in the lowlands during these periods. In between, however, a ridge of high pressure and strong inversions caused poor air quality around the mid month time frame. 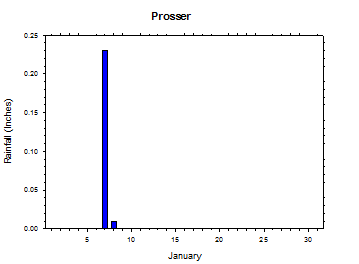 As a result of the lack of mixing, it was the coldest January at Prosser since 2008, and the coldest average January high since 2004. 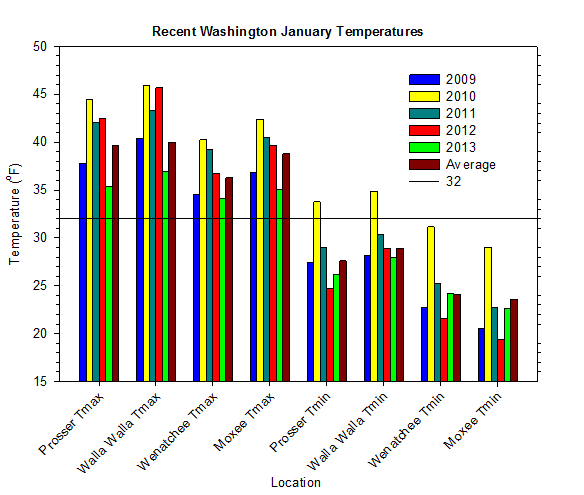 Ironically, if Washington experienced a weather pattern during the late spring that was identical to the one observed in mid January, hot temperatures would be the result. It is interesting to note that the January high temperature was much cooler than average, while the low temperature was only slightly below average. Due to the low clouds and stable inversions present for much of January, high temperatures in central Washington were relatively cold. However, a lack of arctic air led to low temperatures that were not abnormally cold. Despite being 7 degrees colder than January 2012 during the day, this January was actually warmer at night than last year. 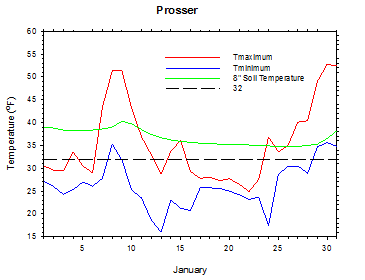 Overall, Prosser experienced a lack of temperature extremes, with neither very warm days nor very cold nights in January. Unlike December, when stormy weather led to strong mixing and warm lowland temperatures, this January was generally cold and stable in the eastern lowlands. By contrast, the exposed, high elevations of the west slopes of the Cascades were not very cold. The benign and stable pattern caused strong inversions that produced rare weather events around mid month. For example, on January 15th, the south central Washington lowlands around Yakima and the Tri-Cities were up to 30 degrees cooler than mountain locations like Paradise, Mt. Rainier, even during the afternoon! The reverse is normally true, especially during the spring, as temperatures are often much colder in the mountains than in the lowlands. 2013 began with uneventful weather, as the state remained under the influence of a ridge of high pressure. Despite generally dry conditions, cold temperatures continued east of the Cascades thanks to low clouds and limited mixing. However, a weak storm moved through the state on January 5th, bringing snowfall to parts of the central Washington. The system signaled the beginning of a pattern change, as a more active period commenced on January 7th. A storm system brought a great variety of weather to Washington. As rain fell in western Washington, snow, mixed precipitation, and rain fell in eastern Washington. Strong winds caused rapidly warming temperatures in parts of eastern Washington, as the cold pool finally began to mix out. College Place reached 55 degrees on January 7th, while Wenatchee Heights recorded numerous wind gusts of over 60 mph. A stronger and warmer storm entered the region on January 8th, as more rain fell in western Washington, and further warming occurred in eastern areas. Over an inch and a half of rain fell northeast of Bellingham. Highs reached into the mid 50s in parts of southeastern and western Washington, as gusty winds persisted. Early on January 9th, the temperatures were mild again in southeast Washington due to breezy conditions, while rain lingered in western Washington, and rain changed to snow in the Cascades. 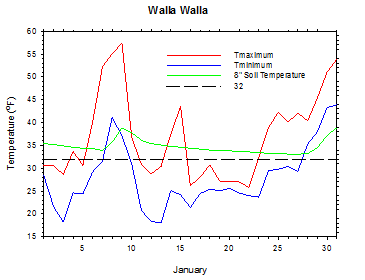 Temperatures approached 60 degrees near Walla Walla and the Tri-Cities, while nearly 2 inches of rain fell at Long Beach. The system exited Washington late on Wednesday, January 9th, as cooler and drier air entered the region under northerly flow aloft. Cool and less active weather prevailed during mid January. Cold temperatures began on January 11th, especially east of the Cascades, under northerly flow aloft. 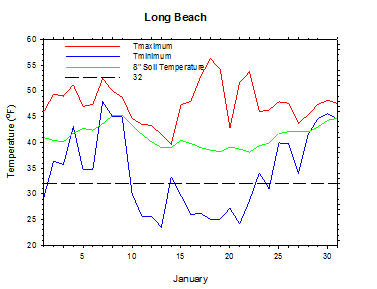 Conditions over the weekend of January 12/13 were mostly sunny and dry. Highs were in the 20s and 30s, with lows in the teens and 20s, although temperatures fell to as low as 1 degree at Broadview (Ellensburg) on January 13th. Overall, January had transitioned from cold early to mild from the 7th to 10th and back to cold again around mid month. As the high pressure ridge moved inland, the mountains and coast warmed rapidly by January 15th, while an inversion began a period of poor air quality and only moderated warming east of the Cascades. In fact, a rare daytime temperature profile developed on January 15th. As Paradise, Mt. Rainier recorded temperatures in the 50s, parts of south central Washington were only in the 20s and 30s. Slightly more active weather returned on January 23rd, as some weak systems moved through Washington. The lowlands slowly warmed while the mountains cooled. Stronger onshore flow and low pressure on January 28th brought the most significant snowfall to mountains in several weeks. Also, significant rain fell from the 28th to the 30th in parts of western Washington. However, as warmer air moved in from the west, strong winds caused increased atmospheric mixing. As a result, temperatures climbed to around 60 degrees in parts of central and eastern Washington on January 30th. 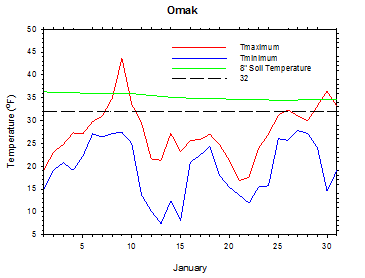 The cold surface air failed to mix out in north central Washington on January 31st, as temperatures remained largely in the 30s around Omak, despite temperatures in the 50s in south central Washington. 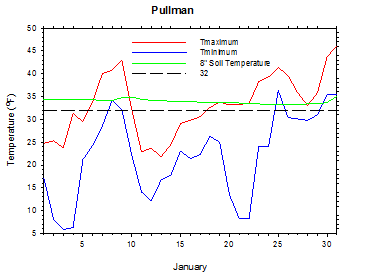 The average January 2013 temperature at Prosser (WSU IAREC) was 30.7 degrees, which is 2.6 degrees (0.7 standard deviations) below average. The monthly average high temperature was 35.4 degrees, which is 4.2 degrees (1 standard deviation) below average. The average low temperature was 26.2 degrees, which is 1.4 degrees below average. The maximum temperature recorded last month was 52.8°F on January 30th, while the coolest daily high was 24.9°F on January 22nd. Low temperatures ranged from 35.6°F on January 30th to 16.0°F on January 13th. Daily average temperatures ranged from 44.5°F on the 9th to 23.0°F on the 13th. The monthly precipitation total was 0.24 inches. 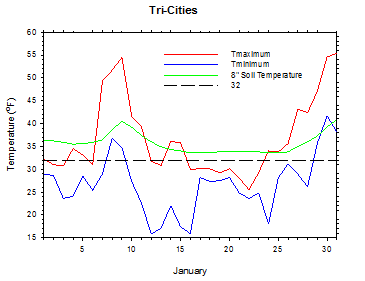 The average wind speed was 3.1 mph, and the average 8 inch soil temperature was 36.8°F. 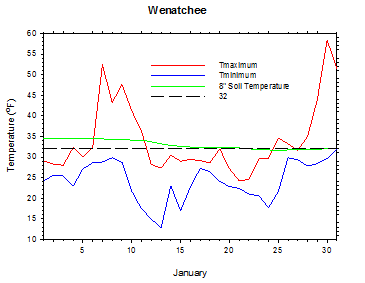 Wenatchee (WSU TFREC) recorded an average temperature of 28.6°F, which is 1.1 degrees below average. 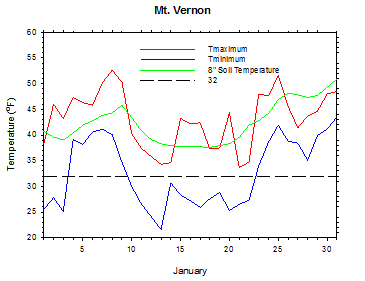 January 7th: The wind gusted to over 60mph at Wenatchee Heights. 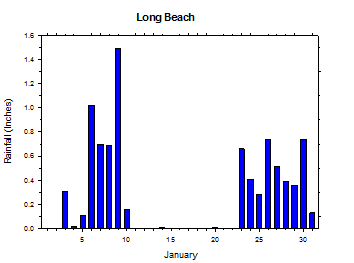 January 9th: Nearly two inches of rain fell at Long Beach. 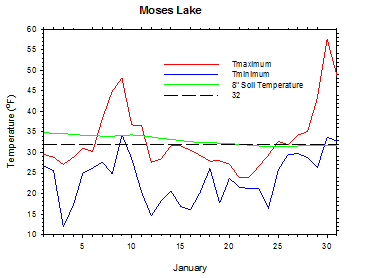 January 13th: The temperature dropped to 1 degree at Broadview (Ellensburg). There were no reports of major crop or orchard damage during January. While there were wet and dry periods in western Washington, areas east of the Cascades were dry for much of the month, although northern areas had snow cover during most of January (National Agricultural Statistics Service). On January 18th, 2012, 14 inches of snow fell in the Centralia area in western Washington. According to the Climate Prediction Center (CPC), slightly below normal temperatures and near normal precipitation are expected during the spring. By late summer and early autumn, there are slightly enhanced odds of warmer and drier than normal conditions.